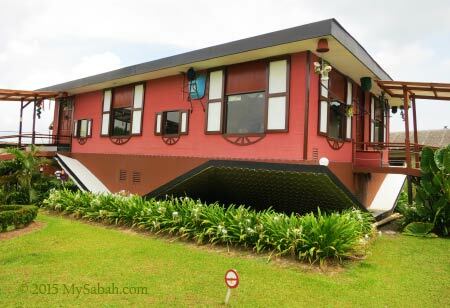 Being the first Upside Down House in South-East Asia, Rumah Terbalik added another fun house just next to it. 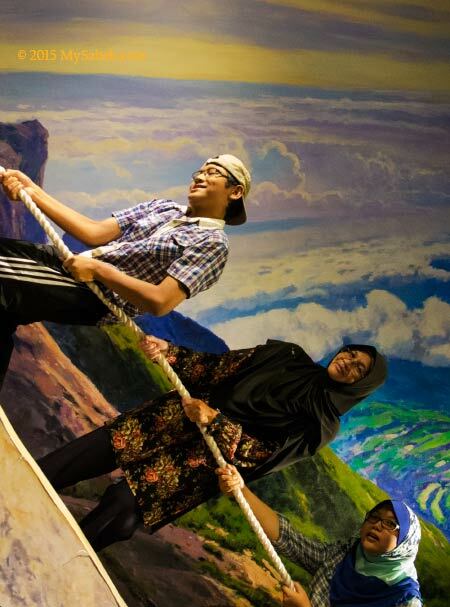 In a nutshell, 3D Wonders Museum is a 4,000 sq. 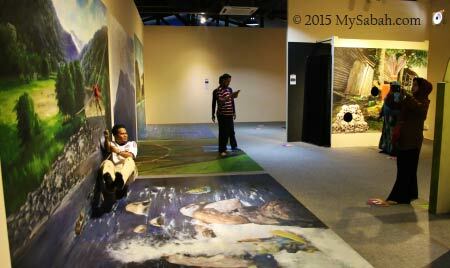 feet gallery that displays 28 painting mostly about Sabah. Visitors can “interact” with the objects in the drawing, as if they become part of the painting (or illusion). 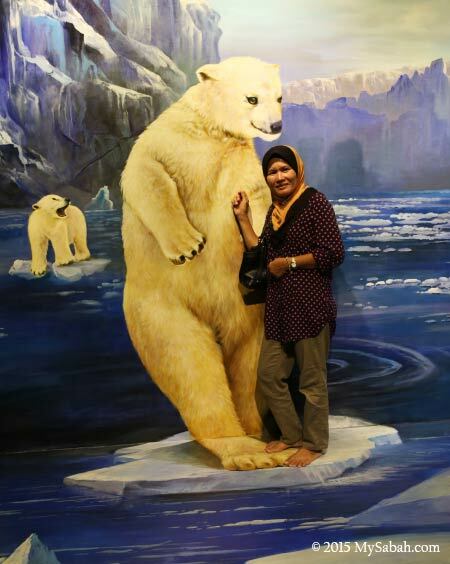 After seeing so many amusing photos of 3D Wonders Museum on social media, I decided to visit this most talked about site in Tamparuli district. This museum can only fit 25 people at a time, so it was a long queue during weekend. Luckily the wait took less than 10 minutes. 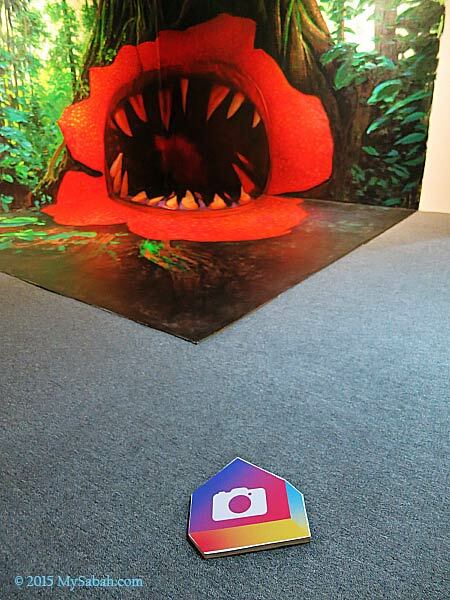 There is no time limit and you are very encouraged to take photos in the museum (photo taking is free). Upon entry, we started playing with something small and simple as a “warm-up”. 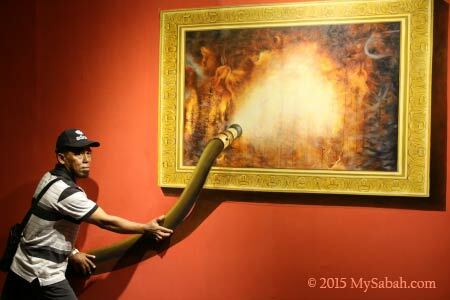 Just position your hands on the right spot of the painting and you are ready for a funny shot. 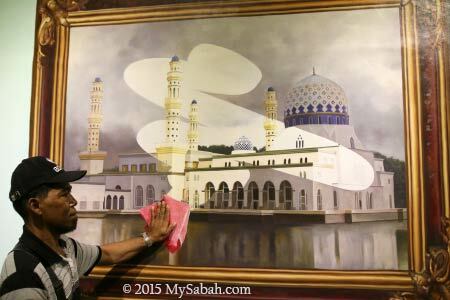 Pic: 3D painting of floating City Mosque, the most beautiful mosque of Sabah. 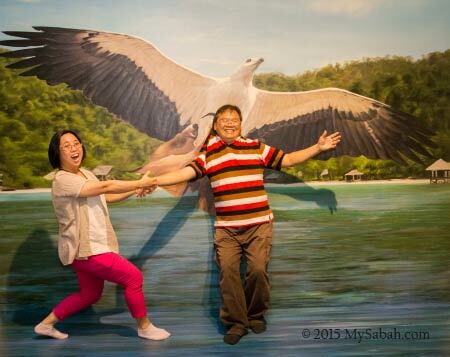 Though there are many attractions in Sabah, 3D Wonders Museum is one of the few family-oriented destinations that excites both adults and children. 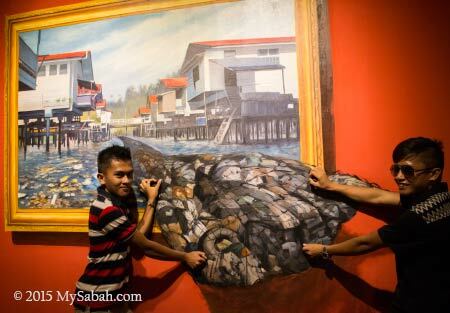 Pic: majority of the 3D art collection here are inspired by various unique culture, nature and destinations of Sabah. 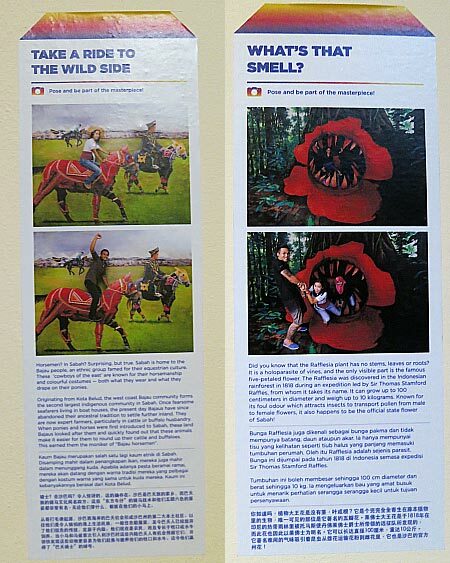 You can read the signage to learn more about the subject of each painting. 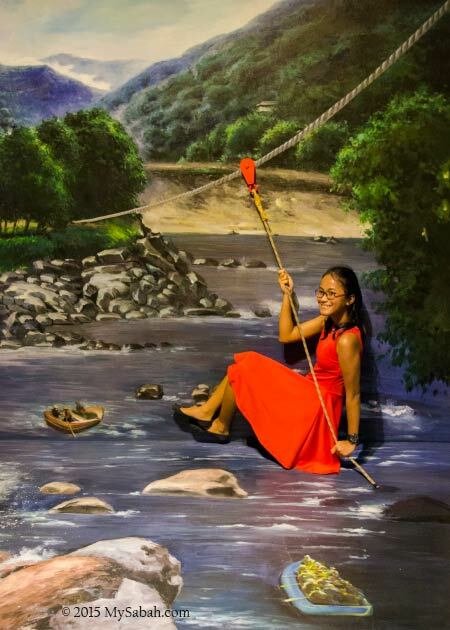 The photos of signage also shows you some good ideas on how to pose with the painting for the most entertaining effect. Of course, you can try other creative poses. Pic: Photography pointer that tells you where is the best spot and angle to shoot the picture. Don’t worry if you travel alone. The friendly staffs are always around to guide you and to help you to take picture of you in action, so you may leave your selfie stick at home. 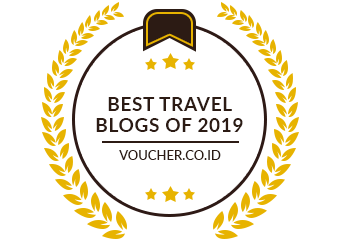 I chit chat with some of the tourists and find that many of them are friends and family from Brunei, Peninsular Malaysia, etc. 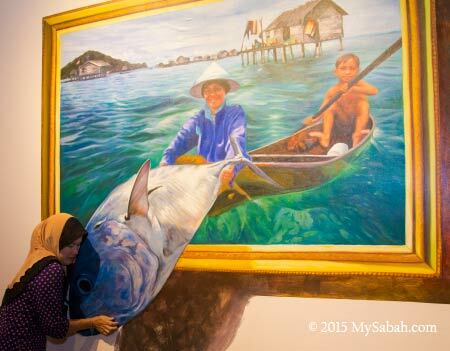 Then I moved on to the nature theme that have big painting features the eco-treasures of Sabah. The way they present the theme is probably more exciting than the real things. 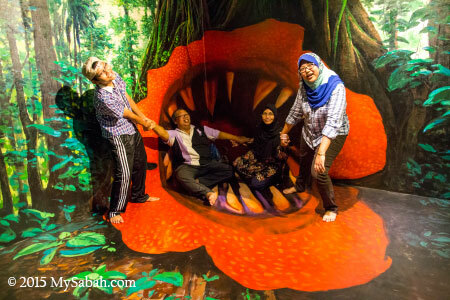 For example, there has been a myth that our giant pitcher plant and rafflesia flower of Borneo are man-eaters, so the museum turns that fantasy into something touchable. 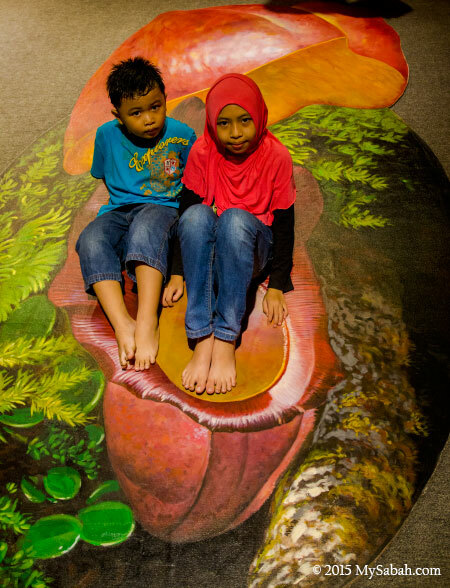 Pic: children being eaten by sitting on Nepenthes Rajah, the largest pitcher plant in the world. Pic: Most murals span across wall and floor to give them more depth and realistic look, like the rafflesia flower painting above. 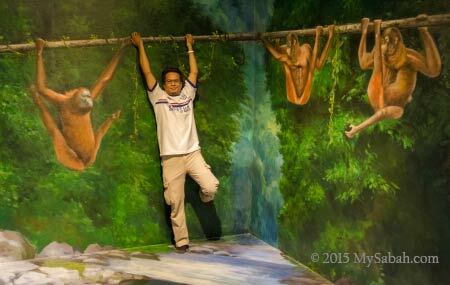 Pic: hanging out with Orangutan, the wild man of Borneo rainforest. 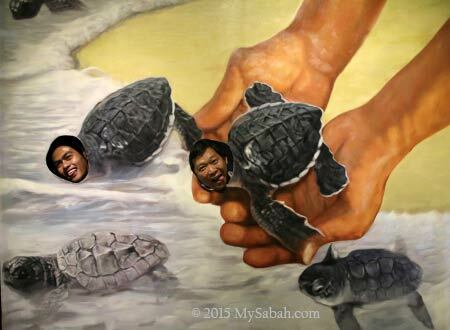 Pic: this is how baby turtles feel when they are released. Pic: Polar bears on melting ice cap, a warning for global warming. 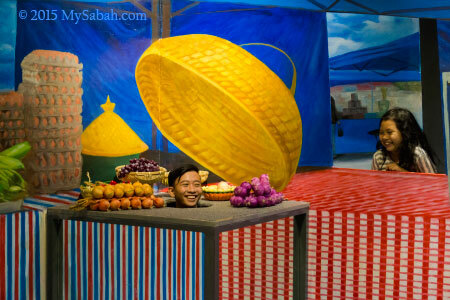 Sabah is famous for its vibrant and colorful culture. You can pretend you are in a cultural journey. Don’t be squeamish while taking photos. Be playful and imaginative, the more you interact with the painting and blend into scene, the better the photos. Your photo would look pretty lame if you just stand straight and act normally. Pic: Magunatip bamboo dance, great pose and expression bro! 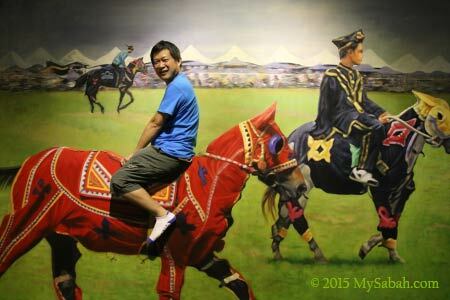 Pic: horse riding with Bajau, the Cowboys of the East. Pic: photo booth of Murut headhunter. I meant to be funny but it looked so real that it was a bit creepy instead. 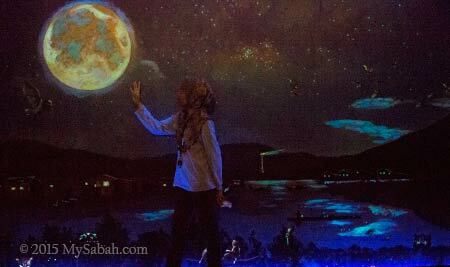 Let the paintings take you to popular places in Kota Kinabalu, Kota Belud, Kiulu, Semporna, Kinabalu Park, Ranau and Sandakan. A photography tip for taking better 3D photo – reduce the power of camera flash, because the reflection and shadow cast by strong light would make the painting looks flat and fake. This can be difficult if you are not using good camera. 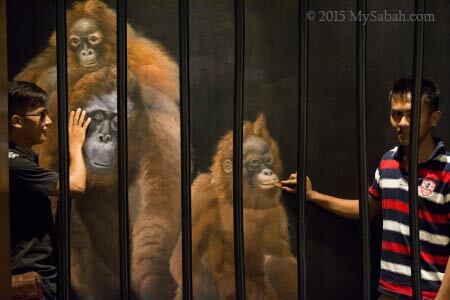 Pic: This painting is the favorite of everyone because it looks “dangerous”. Pic: Due to earthquake, climbing to Mt. 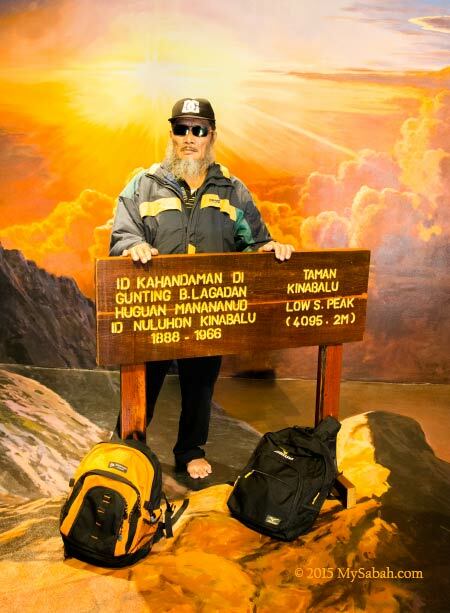 Kinabalu is halt until further notice, but you still can take a photo of the summit here. Pic: May be you should try harder for the challenge, mom. Pic: Zip Borneo, the longest flying fox zipline in Borneo. The illusion section gets the most laughters. It’s just awesome. 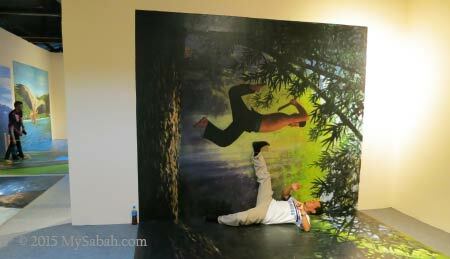 Pic: This silat fighting photo puzzled me the most. I was wondering why all my friends could do flying kick so easily. …until I saw how it’s done lol. It’s like breaking the magician’s code. This can spoil the fun so I only reveal one secret here. Pic: The Shrinking Room (or Ames Room). Sometimes you just can’t trust your eyes. Pic: Can you figure out? Aren’t you entertained? Pic: Night view of Kota Kinabalu city. The UV lights will make your cloth glows in the dark. 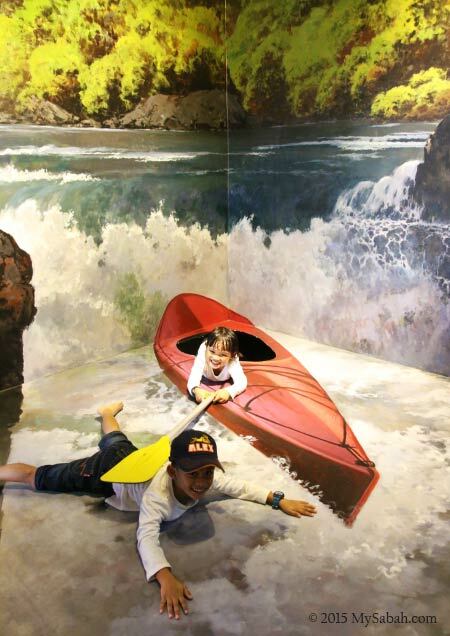 You can save a few bucks if you visit both 3D Wonders Museum and Upside Down House (2-in-1 package). You can take their shuttle depart from shopping malls (see below) to this place for RM50 (≈US$12.50) per person. Please call +60 18-8614688 / +60 88-230534 in advance to book a seat (before 4:00pm). 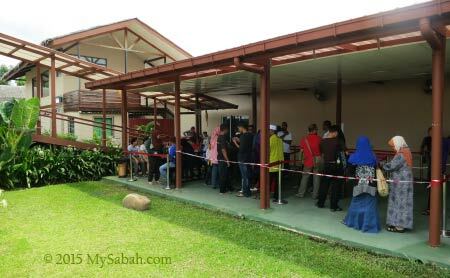 Address (see Location Map): Kampung Telibong, Batu 21, Jalan Telibong Tamparuli, 89208 Tuaran, Sabah, Malaysia. 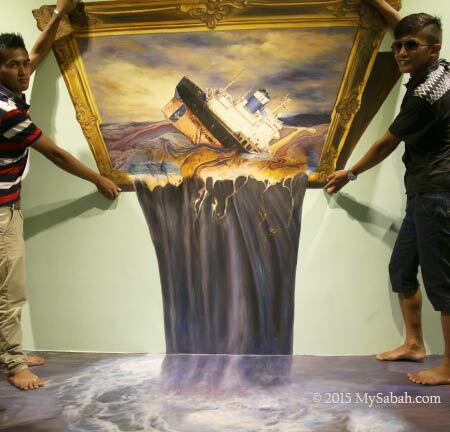 Facebook: Rumah Terbalik – The Upside Down House in Borneo!